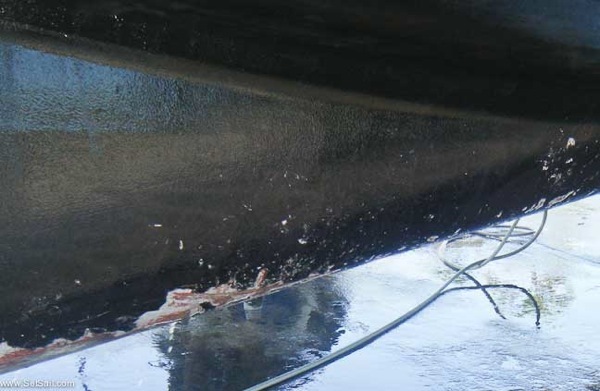 SetSail FPB » Blog Archive » FPB 64 Vs Reef – Are The Factors Of Safety Sufficient? There is superficial paint damage forward which coincides with a water depth of about 3.5′ (1.05m). The damage is mainly in this area and all the way aft, indicating coral head tops with deeper water between. This is the leading edge of the prop skeg, here about the same depth as the forward abraided paint area. 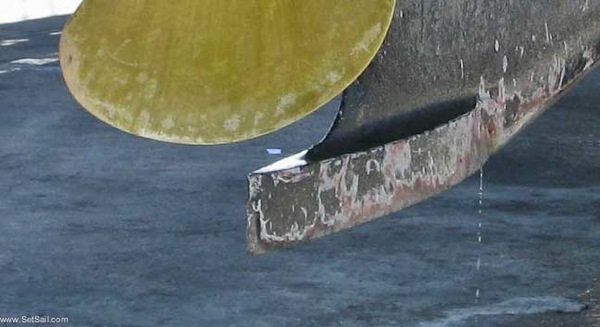 The abrasion on rudder tip and skeg bottom show the same water depth as is found forward. The rudder probably cut into the coral on impact. We have used a factor of twice ABS on our rudders for many years. This is an indicator twice ABS is on target. The fact that the prop coating is mainly intact tells us the skeg is doing its job. Shallow draft reduces the amount of sea bottom (or coral) in contact with the hull and appendages. Even a foot/30cm more draft and the ability to float free would have been severely curtailed. 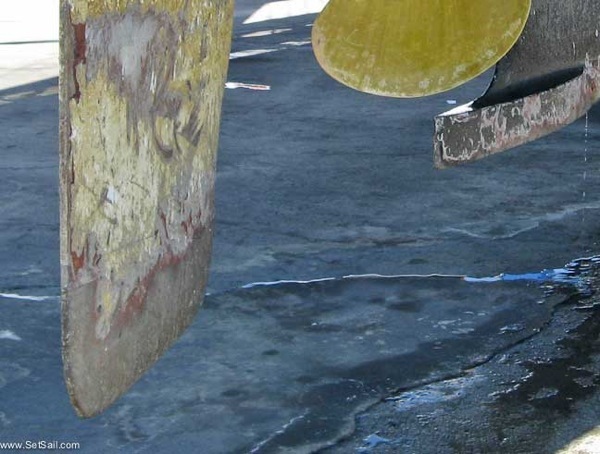 The rounded canoe body (hull) of the FPB type yacht skids easily on the bottom and does not dig itself in as is the case with hulls that have chines or harder edges. The fact that the lee stabilizer fin broke free should be considered a benefit in that it could not anchor the boat in place. Becoming trapped on a rising tide, rather than the reverse, was good luck. Whereas the crew of Iron Lady had the luxury of waiting, has they hit on a falling tide fast action to free themselves would have been advised. As an aside, knowing the state of the tide when on soundings, is always good practice. 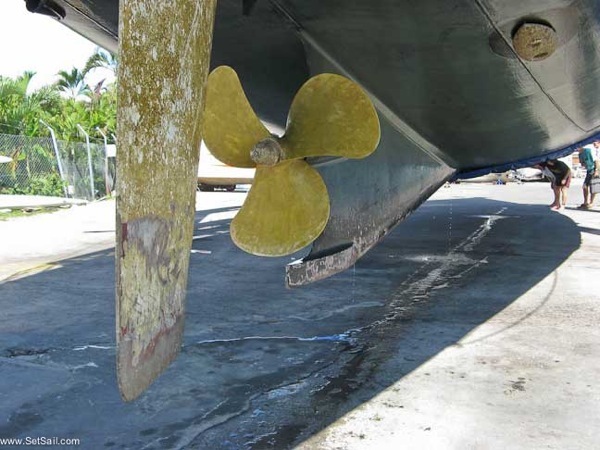 A structurally sound full depth skeg ahead of and below the propeller protected the prop from damage. Although not a factor here, the double bottom, water tight bulkheads, and oversized drive line components allow a range of tactics to save the boat that would not otherwise be available. If you are going to spend extended periods cruising, incidents like this will occur. Not often mind you, but like handling severe weather, it is better to be prepared for the worst, rather than just hoping for the best. Although we cannot foresee all eventualities, nor protect ourselves from everything, we like knowing that we have a design under us which will mitigate the results of operator error, the capriciousness of Mother Nature, or just plain bad luck. This entry was posted on Friday, September 9th, 2011 at 12:54 pm and is filed under FPB 64 Updates, Most Popular. Both comments and pings are currently closed. Steve from these pictures it looks like mostly paint damage. Hard to gauge the depth of the scratches, but they certainly don’t look bad. Do you know if there is any metal work to do? As far as we know, no metal work, just paint. But Circa will give her a thorough vetting just to be sure. What prop coating are you using? How effective is it over time? We have tested two different systems. If you search the website for what we have now on WInd Horse, Prop Shield, you will find several references. The product used in New Zealand is called Prop Speed. Both work for a year or more. Exact comparisons are hard, but properly applied we prefer Prop Speed. Steve, Linda, you are seriously setting the standard by which all offshore yachts should be built. I have followed your travels, with envy, for years now and I knew you had a great boat when you put your own FPB in the water, but wow, what a testament to your great designs. Thanks for all the great ideas we can all put to practice with our own little ships. Kudos should be spread equally with Todd Rickard, who oversees things with Circa, and Bruce Farrand and his team at Circa.